Tried SEO Internet Marketing Services Before? Here’s why… Many SEO service companies promise #1 rankings – and they might deliver on paper. The problem is that many target keywords that no one is searching for. If no one is searching for these keywords, you are not getting the visibility you paid for, even if you are ranked #1 on every available search engine. Our Free Internet Marketing Report can help. CourseVector’s SEO Internet Marketing Services are different. CourseVector focuses on Organic SEO. Organic SEO is defined as search engine ranking results pages that appear because of their relevance to the search terms, as opposed to their being advertisements. Organic SEO is an investment that produces long term Return on Investments and does not require large monthly expenditures. Organic SEO is most effective when a page has relevant keywords and content, arranged in a technical manner that allows Google and other search engines to consider the web page important to those who may be searching for the targeted keywords. As such, once a page is properly “optimized” rankings should continue to improve over time. Thus a small one time investment continues to pay dividends well into the future. Detailed analysis suggesting targeted keywords that provide the most potential for the investment. Page speed analysis and recommendations. Detailed reporting for each optimized page including starting rank. For a small monthly fee CourseVector will execute routine website audits to ensure that your website conform to web quality standards. These audits will be completed using third party tools. We will provide support for the implementation of all organic on-site SEO factors along with continued monitoring to ensure your website is not susceptible to Algorithmic or Manual Action penalties. We will assist with the SEO requirements of content including press releases, keyword research, trend analysis and more. CourseVector’s Internet Marketing Services can also include content writing, blog post optimization, page layout and design, and most other web design and marketing considerations. Simply request a price quote for the services you need. You have nothing to lose by allowing us to complete a Free SEO Website Marketing Analysis. We will provide your free report along with a few suggestions that, if completed, will give your website a boost in organic search. 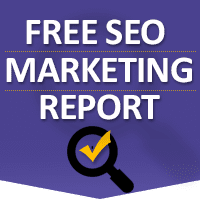 Take a look at a Sample Free SEO Analysis Report.